Hunters are at home in the wilds. They know the beasts and monsters that lurk in the untamed lands. Hunters often tame them, using the bow to strike them with various afflictions and problems before capturing them, and using them for their own purposes. Hunters thus are capable of great damage and decent support, though their power fluctuates depending on the wildness of the place. They are a back-row job, but powerful with weapons for that fact. These are the basic statistics for anybody with Hunter set as their main job. Characters with Hunter as their main job can use the following skills. Mind: Hunters move instinctively through the trackless lands. Mind: Hunters communicate much with simple words and gestures. Mind: Hunters know much about the wilderness instinctively. Hunters gain the following powers as they gain job levels. The three major categories of Huntings are Tame, which focuses on subduing and recruiting monsters; Shot, which augments the hunter's attacks; and Sense, which reveals info and enhances a hunter's abilities. Hunters can make the attacks of their allies keen. Tech 1 A The target gains an Accuracy bonus equal to the hunter's level. Hunters can capture a monster, and unleash it later to work for them. Tech 1 A If an enemy is in Crisis, the hunter can target them with Catch. Catch: The target is removed from the battlefield, and stored. Only one monster can be stored at a time. Once they have used Catch on a creature, the hunter can use Release. Release: The caught monster is freed, and uses their Blue Magic as the hunter dictates. The hunter can then use Catch again. Hunters tip their arrows with venom. On a roll of 10 or better, the target is inflicted with Poison. 5 MP You learn the target's elemental properties: weaknesses, resistance, immunity, absorption, etc. Hunters will cow creatures into obedience. Tech 2 A Deal damage to the target equal to HALF of their remaining HP. This is considered a Death effect. Hunters can fire an arrow with a blinding venom on it. On a roll of 10 or better, the target is inflicted with Blind. Hunters notice even the hidden things. 20 MP Until your next turn, you ignore all invisibility. 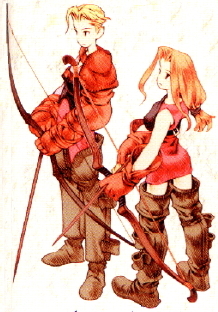 Hunters can manipulate enemies in the midst of combat. Tech 3 A The hunter can choose the target's next action, and the target of that action. Hunters ignore their foes defenses with this shot. Tech 2 A Deals WEAPON POWER damage, ignoring Stamina. Hunters know the weaknesses of enemies. Tech 3 A The target crits on their next attack. A hunter launches a flurry of arrows at foes! Tech 4 A Deal WEAPON POWER damage four times to targets of your choice. Hunters can customize their abilities with feats, gaining new abilities and options. Hunters can persuade their prey to take a short nap. Tech 1 A Roll 1d20. Add +5 if the target is in Crisis. On a roll of 10 or better, inflict Sleep on the target. Hunters can confuse their prey into damaging itself. On a roll of 10 or better, inflict Confuse on the target. Hunters can persuade their prey to stay where they are. On a roll of 10 or better, inflict Immobilize on the target. Hunters can make their prey more reticent. On a roll of 10 or better, inflict Paralyze on the target. Hunters can light their ammo on fire before launching it. Tech 1 A Deal WEAPON POWER Fire damage. Hunters can blast their enemies' magical power. 10 MP Deal WEAPON POWER damage to the target's MP. Hunters can set a trap for those that defy them. Tech 1 A If the target attacks, they are dealt DOUBLE WEAPON POWER damage to their MP. Hunters can force monsters to not act. Tech 2 A Roll 1d20. Add +5 if the target is in Crisis. On a roll of 10 or better, inflict Disable on the target. Hunters can silence his enemies. On a roll of 10 or better, inflict Silence on the target. Hunters can coat their arrows in freezing herbs. Tech 2 A Deal DOUBLE WEAPON POWER Ice damage. Hunters can cover the battlefield in arrows. Tech 2 A Deal WEAPON POWER damage to all enemies. Tech 2 A Gain Invisibility. This trap inhibits an enemy's magic more harshly. Tech 2 A If the target attacks, they are inflicted with Silence. Hunters can force monsters to their side. Tech 3 A Roll 1d20. Add +5 if the target is in Crisis. On a roll of 10 or better, inflict Charm on the target. Hunters can charge their arrows with electricity. Tech 3 A Deal TRIPLE WEAPON POWER Lightning damage. Hunters can blast monsters especially well. Tech 3 A Deal TRIPLE WEAPON POWER damage and, if the target is not a humanoid, inflicts Death.